Beneath a giant weathered oak lies the barren remains of an old English church that was probably levelled into rubble ages ago by forces of disbelief and hatred against what was sacred to the common folk. But suddenly appears a shimmering light in the wintery sky and the time travel begins up until when that old church’s bell began to chime. Was it a journey back to medieval times or a time period different from any piece of history known to man, or was it just a weird dream or hoax. I don’t know if I can be a full time storyteller or actual novel writer, but I do try. 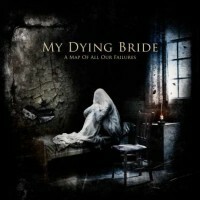 These sensations of coldness, agony, religious enigmas, ancient beliefs, battle of love and hate and depression kept me alive while I listened and deeply connected to the new album named “A Map Of All Our Failures” by English Gothic / Doom Metal masters of MY DYING BRIDE. Once this group was the leading force of deathly Doom Metal alongside their peers of PARADISE LOST and ANATHEMA, continuing the 70s hazardous gloom of the true Doom Metal conspirators, BLACK SABBATH. Years after their early 90s glory, MY DYING BRIDE may have changed from a full time extreme act to something a bit more restrained but still I believe that they kept that British elegance towards the Gothic Metal nature, just as PARADISE LOST shifted back in the day, and their own theatrical qualities. Sluggishly advancing on the road to another failure after another failure, not musically of course but mentally, MY DYING BRIDE, through eight epic tracks filled with both coldness and sorrowfulness, displayed laments to anything that died along theirs’ and others’ journeys along the epochs, retained the magnificent glory that prolonged within classic Doom Metal, especially the version made by English bands. Although there were sections where their older fiendish Death Metal outrages came back to haunt, those sounded suitable to the manifold those were put into. MY DYING BRIDE seemed mournful on this release more than on their earlier material, particularly the creations of the 90s. As I mentioned each song is just another failure that also serves as an integral piece in the map or puzzle the band forged over their material. At first I had to readjust my mind to the fact that it is bound to be a slowly moving vessel in a sea of black or maybe the slothful giant’s footsteps under heavily raining skies in a valley of green. With each thump of the snare, each harmonic guitars’ passage, each touch of keyboards or violin, I felt as if I was viewing and old movie or bearing witness to an amazing melodramatic tale unfolding right before my eyes. I can’t say that I was too overwhelmed by several of the tracks of this release because sometimes these slow tempos just kept inexorably going forward with the same frolics without crossing any boundaries. However, since each song was a whole epic story on its own, I shared many moments, including long period of captivating concentration and appreciation. “The Poorest Waltz”, gloomy as the rest of the numbers among this somewhat depressive yet spiking release, is my special kind of hit. The multi-channeled vocals that sounded like a one man show playing several parts in a tragedy impressed quite a lot while the appealing guitar melodies and lead guitar outputs were mind blowing along with cold as ice violin verses under heavy riffing as backing rhythms. “Like a Perpetual Funeral” took me done right after the debut build up that bulged and exploded after a few minutes. The main riff that came out of this section made me close my eyes and swallow the lyrics that so softly entered my mind. I actually felt the sea gushing out there far away. Damn, that is a wonderful experience and this song is supposed to insinuate a funeral, ohh the agony of it all. “Hail Odysseus” is the failure from ancient times, a song that on its own have crossed many stories over the years. I can also put in “A Tapestry Scorned” and “Within the Presence of Absence” as fine examples of why this particular genre of Metal should be tended with gloves of silk. Doom Metal isn’t just for the thrill of it, it bears serious events, probably sorrowful ones of negativities but it is deep and captivating if done right. MY DYING BRIDE amazed me with a great release and left me wishing there were at least two more tracks for further enjoyment.